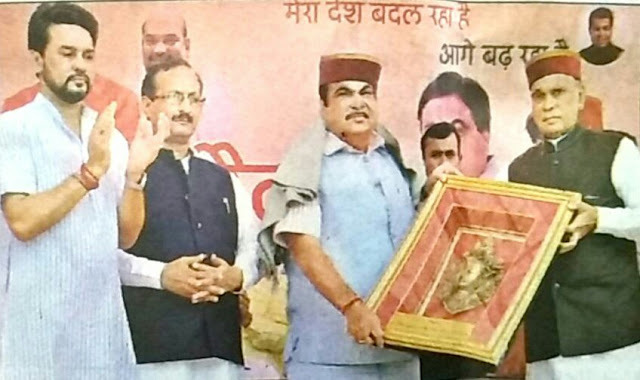 Nitin gadkari central minister is on his himachal trip . He have given lot of gifts of NH earlier to upper shimla area of rohru , Jubbal, kotkhai and chopal. This time it was lower himachal's turn. This time he announced to make Dharamshala -shimla as four lane , which will cost around 5000 crore rupees. With fourlane to dharmsha Dharamshala to shimla , Nitin gadkari also announced first flyover of Himachal in una district. With this announcement number of NH that central government will construct is 49 and total number of national highways is not 70 in state which was 21 earlier his trip. Nitin gadkari announced drman-kelaad via sinhuta -jot-chamba-teesa as national highway which will cost arounf1400 crore rupees. Pathankot-mandi and Dharamshala -shimla road will be constructed as fourlane. Himachal pradesh got budget of 60000 crore from Nitin gadkari's department. With this he also announced national highways authority in Himachal. Bjp leader and central minister Nitin gadkari inaugurated projects of costs 2437 crores in Kangra district. He also inaugurated baathu pul cost of 11 crores in agricultural university palampur. Other than this pathankot to mandi four lane and draman to sihuta -chamba-kilad was announced.